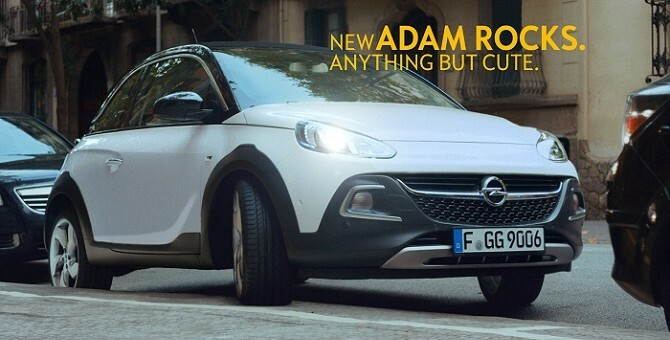 Opel has launched a new TV advertising campaign for the rugged Adam Rocks city car using its “Change your mind,” slogan seen in the automaker’s other TV spots. Opel says the commercials are “fresh, cheeky and above all humorous,” and look to alleviate the Adam of its “cute” reputation. The ads were developed by Hamburg-based ad agency Scholz & Friends. The two commercials will run on German TV channels and on other digital media platforms, while other related ads will be featured in high-circulation German magazines, newspapers and on billboards. The Adam Rocks is described by Opel as being a “mini crossover” that is “creating its own market segment.” It introduces Opel’s all-new 1.0-liter Ecotec turbocharged engine and is also available with General Motors’ IntelliLink infotainment system. Sales in Germany started this month at €15,990 ($20,516 USD).